"You're going to see Democrats and Republicans lining up against this," Alan Grayson says. A "conscience vote": That's the congressional euphemism for an issue on which partisan loyalties are so scrambled that lawmakers must make up their own minds. Both Nancy Pelosi and John Boehner have used the term to describe the authorization of military force in Syria, meaning they won't be "whipping," or pressuring members to vote a certain way. But one Democratic congressman will be whipping -- against the resolution. Alan Grayson, the Florida liberal and civil-libertarian, has been rallying opposition to the use of force both among his colleagues and among the public. He believes the momentum is on his side and the authorization is doomed to fail in the House. I interviewed Grayson about his effort and his view of the issue Tuesday. This is an edited transcript of our conversation. You started an online petition against intervention in Syria. Do you think it's gaining traction? Yes, we've gotten 25,000 signatures in just a couple of days. 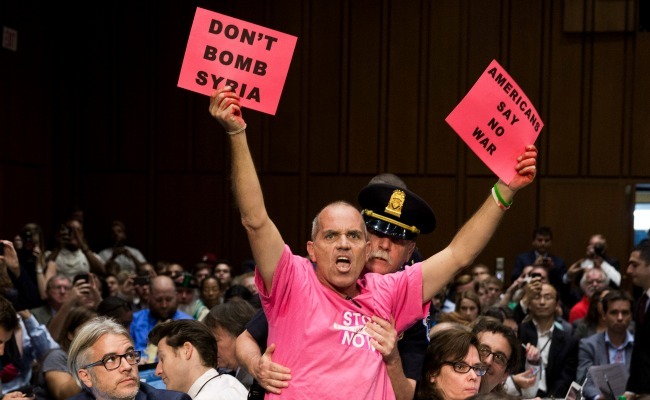 It's a sign not only that the public is against attacking Syria, but also that they're willing to do something about it. [Ed. note: As of Wednesday afternoon, it was nearly 35,000.] We're seeing not only a lot of opposition in terms of numbers, but also a great deal of intensity. It's an unusual thing to post a petition online, not do anything to promote it, and see almost instantly 25,000 people sign up. We're going to put that to good use. We're going to have people calling their congressman and sending emails. In the case of congressmen who are on the fence, they'll hear from huge numbers of their constituents who want them to vote "no," and it's going to have a dramatic impact. You also say you're going to whip your colleagues. Has that effort started? We have started it. The first thing we have done is very carefully keeping track of what our what colleagues actually say about this. A very substantial number of Democrats and Republicans have come out against attacking Syria, and we have begun the process of informing our Democratic colleagues about what their other colleagues are saying. We're circulating a letter that quotes a dozen other Democrats in Congress, as well as me, who have stated their reasons against an attack. That's the first step in what will be a very sophisticated process of persuading our open-minded colleagues on both sides of aisle. Are we going to see another vote like the Amash amendment, where both Democrats and Republicans were almost equally split on the issue of National Security Agency surveillance? You're going to see Democrats and Republicans lining up against [the military authorization], but I think there's substantially more opposition to this than there was support for the Amash amendment already. The Washington Post is keeping track, and at this point, the number of members of the House who’ve spoken out against the resolution outnumber the declared supporters by more than three to one, and it's approaching four to one. You're counting leaners as "no" votes? The Post has a smallish category for "opposed," but a large category in both houses that's leaning in that direction. That in itself is very revealing, isn't it? There's no "leaning yes" category. When you actually look at the comments being made by those who are characterized as "leaning no," I think they're leaning pretty heavily. If anything, the sentiment when members talk to each other is far more negative than the public [statements] reflect. Particularly among Republicans -- the Republicans are hearing overwhelmingly from their own districts that this has nothing to do with us. We're talking about ordinary voters and activists both, they’re vehemently against this. If anything, what you're seeing in public is an understatement of the actual sentiment among House members. We all come to this with an open mind -- I did, at least. But people heard the arguments, and now they're starting to hear from their constituents. Believe me, it's not going well for the pro-war point of view. There was some thought that John Boehner and Eric Cantor coming out in favor of intervention might mean momentum was building in that direction. Absolutely not. I think it's a fantasy to talk about momentum. Conceivably it will end up losing two to one instead of four to one. But there certainly is no momentum in favor of the other side's point of view. They're going to have to line up a staggering percentage of the undecideds to even come close. The ones listed as undecided, I’ve talked to lot of them. They're not really undecided. They're just waiting for a prudent time to make clear that this doesn't make sense for America. You sound pretty confident that the resolution will be defeated. I am confident it will be defeated in the House. That’s not to say we can defeat it by doing nothing. The administration is trying to dominate the discourse here. They’ve scheduled four meetings with Democratic members this week, and they are basically seeing to it that skeptics or opponents don't get any time in front of other members. They feel if they just repeat themselves often enough, they'll be able to prove their case. I don't think it's going to work based on what I’m hearing. Everybody goes in with an open mind, but all the administration's cards have been turned over. At this point, members are painfully familiar with the arguments already. There’s no sense among members that they're going to be able to explain a "yes" vote here to their constituents, particularly if it turns into a quagmire. What the public sees is that we can't afford this anymore. The public also understands that every time we do something like this, it seems to end up a big mess, and America has problems of our own to deal with. There are 20 million people in this country looking for full-time work. How do you explain to them the virtues of military adventurism and humanitarian bombing 6,000 miles from home? Most members will end up voting with their constituents. There are some Republicans who never met a war they didn't like, and [among some Democrats] there's a certain institutional loyalty to a Democratic president. But beyond that, particularly when we're four weeks from a government shutdown and six to eight weeks from the government running out of money, most recognize that [the situation in Syria] is obviously not our problem. How do you respond to the humanitarian argument, that we've got to respond to stop or mitigate the slaughter? That’s a nice sentiment, one which I often share. But the fact is, no one has been able to come up with a game plan here that makes any sense. If we could end suffering in Syria through a military strike, that would be a decision worth thinking about. But no one is suggesting that's going to happen here. No one is suggesting this will end the dictatorship. No one is suggesting this will defeat the al-Nusra rebels who want sharia law and no rights for women. No one is suggesting this will actually prevent a gas attack in the future. No one is suggesting this will do much of anything except give a slap on the wrist to [Syrian President Bashar al-]Assad in hopes that maybe something good will come out of that. I actually would support humanitarian aid to the refugees. There are 2 million of them in Jordan and Turkey right now, and I think they could use our help. My concept of humanitarian aid is food, medicine, shelter, clothing, not bombs. The concept of a humanitarian war, humanitarian bombs, humanitarian missiles, is bizarre to me. I don't support it. Is there ever a time, in your view, when a humanitarian crisis calls for a military response? Yes. Genocide. This is not that. Do you question the case the administration has presented that chemical weapons were used? Based on the evidence I have seen, I believe there was a chemical attack. I had reservations earlier, but they have been satisfied. Further evidence has been proffered that persuaded me. Given the passion you're seeing at the grassroots level, do you see this becoming a litmus-test issue on the left? Could Democrats who vote for intervention lose primaries over it? It's possible, but it hasn't evolved to that point, partly because the president is so firmly in the pro-war camp in this instance. It's a strange thing for a Nobel Peace Prize winner, but there you go. I don't think it's going to go that far. I tend to think other issues will become litmus tests, for instance [cuts to Social Security and Medicare]. Are you disappointed that Obama has chosen this course? I understand that the president is acting on what he regards as principle. He's doing it in a relatively honest fashion. There's been some manipulation of intelligence, but nothing along the lines of what we saw regarding Iraq. I think that the president is basically acting from positive motives, but I think that he's misjudging the situation. I basically feel the same way about Secretary [of State John] Kerry’s position. There are plenty of reasons progressive Democrats might be disappointed with this president, so at this point I don't hold this against him. He’s basically just trying to be a good president. I honestly would much rather see him making the effort to lead than the sort of passivity you see this administration descend into from time to time. But that doesn't change the fact that in this case I think he's extremely misguided.